Bhoothnath Returns is only intermittently entertaining, because writer-director Nitesh Tiwari fails to take his target audience into account. Why does a film geared toward children have a runtime of 155 minutes? And why are so many of those minutes devoted to discussions of how to file paperwork? 2008’s Bhoothnath (“Lord of Ghosts“) starred Amitabh Bachchan as the titular not-so-scary ghost. The sequel finds Bhoothnath the target of jokes up in Ghost World — which looks a lot like Hogwarts — due to his inability to scare children. 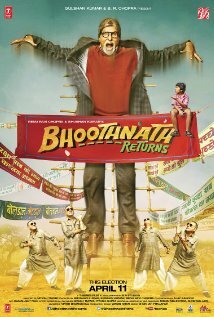 Bhoothnath returns to earth to redeem his reputation, only to run into another fearless kid who can see him, even though no one else can. Savvy street urchin Akhrot (Parth Bhalerao) teams up with Bhoothnath, solving the problems of other earth-bound ghosts and earning money. As their friendship grows, Bhoothnath realizes that Akhrot’s future will never be secure while murderous thugs like Bhau (Boman Irani) run the government. Thus is born India’s first campaign to elect a ghost to political office. For a while, the discussions of the bureaucratic technicalities surrounded Bhoothnath’s run are entertaining, aided by Sanjay Mishra’s funny performance as Bhoothnath’s lawyer. As the second half of the film rolls on, the story gets bogged down in heavy-handed patriotic speeches and lengthy montages depicting differing versions of what will happen on election day. There is a surfeit of montages in Bhoothnath Returns. Instead of briefly panning the camera across the festively decorated grounds before Bhoothnath’s big rally, Tiwari devotes in excess of a minute to a sped-up version of the decoration of the rally grounds. When the movie is already so long, why devote more than a few seconds to something no one cares about? The movie’s strangest sequence also takes place in montage form. As Bhoothnath comes to grips with depth of India’s problems, the song “Sahib” plays accompanied by a montage of photos of desperate, starving people. It’s very grim for a movie geared toward kids, especially since the impoverished state of Akhrot’s own neighborhood is already established. It’s also hypocritical. Earlier in the film, Akhrot derisively mentions making money from foreign tourists looking to experience Slumdog Millionaire in person. How is turning images of peoples’ suffering into a music video in a major motion picture any different? The film’s tedious heavy-handedness rankles because it detracts from an otherwise cute movie. Irani’s villain is the right mix of sinister and clownish. Bachchan is both grudging and caring as he puts up with his willful young friend. Bhalerao does a terrific job as Akhrot, cracking wise but never coming off as a jerk. The young actor is great in a touching scene in which Akhrot tries to conceal the risks of their venture from Bhoothnath. All the fine performances can’t keep Bhoothnath Returns from turning into a glorified public service announcement. Encouraging people to vote is a worthy goal, but it has to be done within the context of the story. The pro-voting message comes across clearly through the story of Bhoothnath Returns, but Tiwari doesn’t leave well-enough alone, tacking on at least twenty minutes of condescending speeches. Jarring celebrity cameos by Ranbir Kapoor, Anurag Kashyap, and Shahrukh Khan — whose presence is the only one that makes a lick of narrative sense — just add to the feeling that Bhoothnath Returns is as much an overly long PSA as it is a movie. This entry was posted in Reviews and tagged 2 Stars, 2014, Amitabh Bachchan, Anurag Kashyap, Bhoothnath Returns, Bollywood, Boman Irani, Hindi, Indian, Movie Review, Nitesh Tiwari, Parth Bhalerao, Ranbir Kapoor, Sanjay Mishra, Shahrukh Khan on April 11, 2014 by Kathy. How could they not call this movie “Voting Bhoothnath”? It just seems like a real missed opportunity.